We introduced the constellation Leo just last week and we are happy to stay in this region of the sky for the time being, because Leo heralds the beginning of Spring. 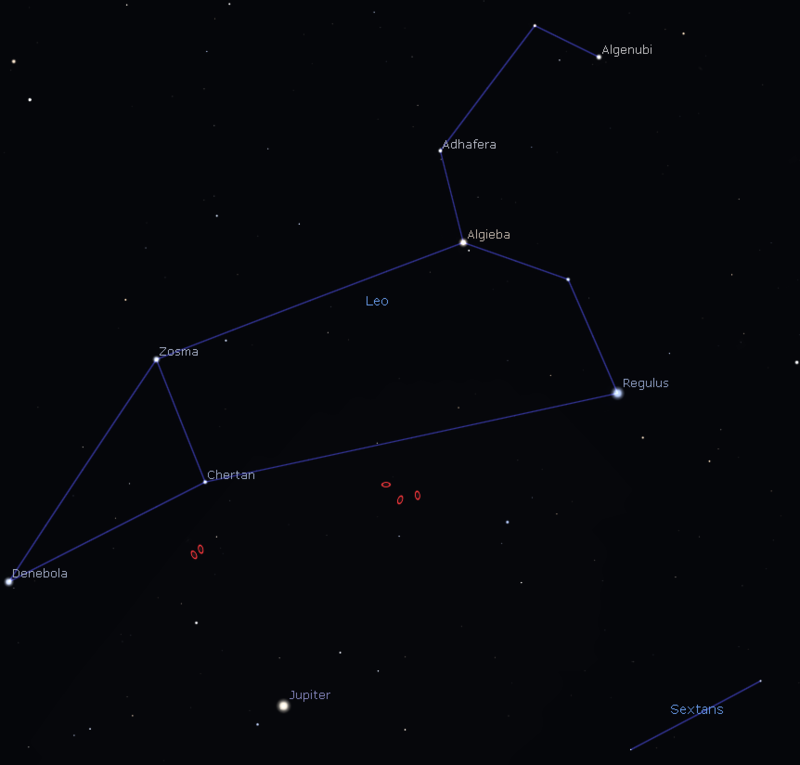 In the southern sky, you will find Leo, which is easily spotted by searching for an upside-down question mark, made by the stars Algenubi, Algieba and Regulus. The body of the lion ends in the bright star, Denebola. Jupiter can still be seen in the southern section of Leo’s empire. In the image of Leo, you can see several ellipses, within which you can see galaxies. All of the stars visible from Earth, for example the ones we see in Leo, are part of our home galaxy, the Milky Way. The red ellipses show the location of other galaxies far outside the Milky Way, which are home to innumerable stars. Wander through the night sky with your Universe2go or binoculars in the direction of the two red ellipses underneath the star Chertan. In a Moonless night, outside of city lights, you can see the pair of galaxies, M65 and M66, with a 10×50-Bino. With a larger telescope or by means of astrophotography a third galaxy will join the party, which astronomers have placed under NGC 3628. The following images were made by amateur astronomer, Philippe Durville. The three disk-shaped galaxies are oriented differently within the night sky. To the left, we can see NGC 3628 from the side and recognize its striking band of dust. Above to the right is the galaxy M65 visible, while below that M66, both of whose spiral structures are clearly recognizable, since we see the galaxy disks at great angle. 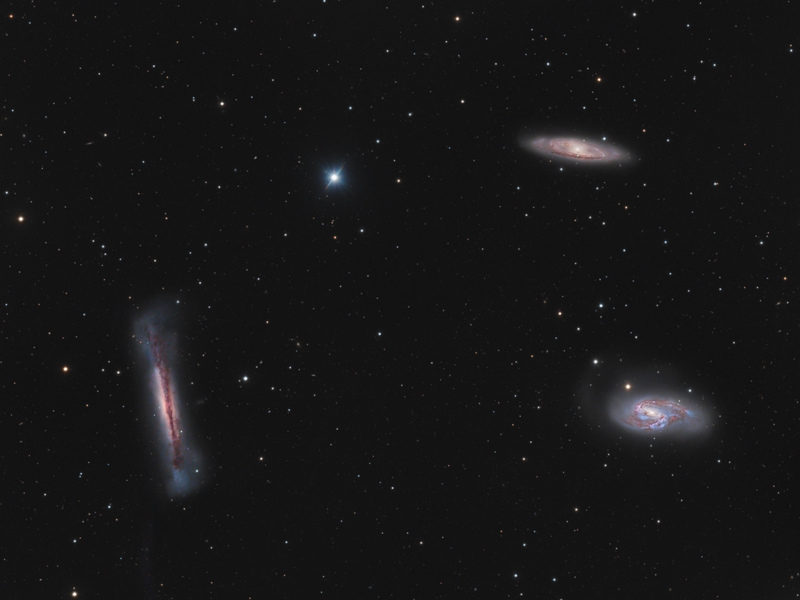 This group of galaxies are known as the Leo triplet and is approximately 40 million light years away. Jupiter is and remains the star of the night sky. We photographed the planet with the camera Omegon Proteus and various filters. 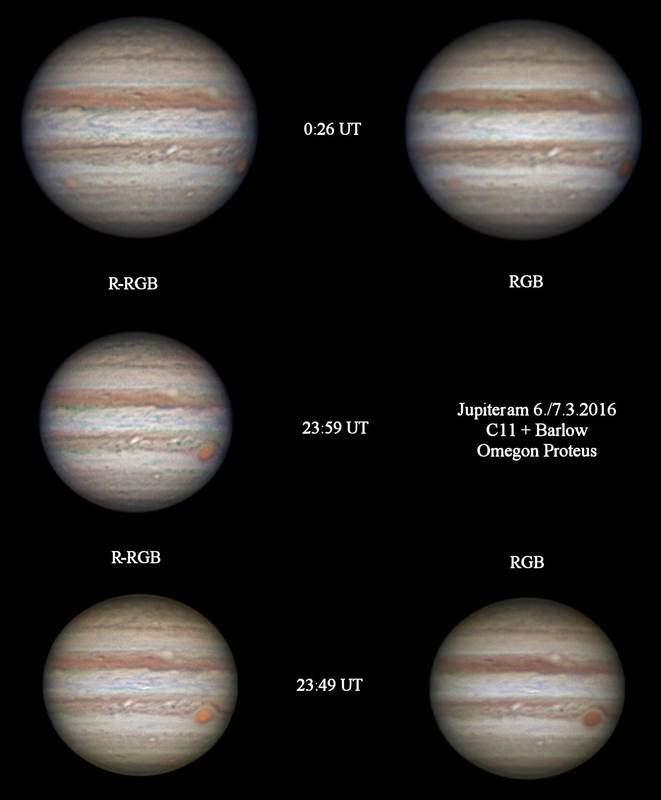 We took several images at different times, which reveals something special about Jupiter: check out the position of the big red spot. This violent storm in Jupiter’s atmosphere moved a significant distance in a relatively short time. The reason for this is that Jupiter, despite its enormity, rotates incredibly fast. For more context: a day on Jupiter lasts only 10 Earth hours!